A deck or patio crafted of pavers is sure to have lines between each stone. Without proper prevention, weeds can find their way through those joints, reducing the appearance and potentially causing damage to the entire floor. With a few preventative measures, weeds can be avoided in the first place. If weeds are already present, there’s no need to stress. Corrective measures can eliminate the weeds and restore the look of your driveway, deck, or patio. Prevention is one of the best methods of weed control. With a little regular maintenance, weeds can be avoided in the first place. 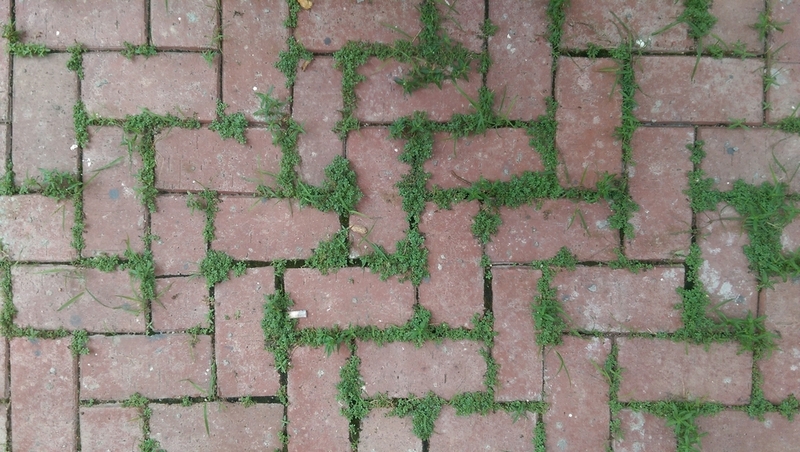 Most of the time, weeds to not sprout up from beneath the pavers. They actually start with seeds that settle between the cracks of the pavers on the surface. Seeds need to take root in order to grow. Sweeping your pavers regularly will disrupt the seeds prior to rooting, helping to inhibit weed growth. Sweeping also removes surface dirt and helps to enhance curb appeal by keeping your pavers looking clean. Installing pavers results in spaces between the bricks or stones. The first step in preventing weeds is ensuring proper installation. A sand bed tightly packed provides a level foundation for the deck or patio. Once all the pavers are in place, additional sands should be packed into the crevices. This sand ensures each paver stays in place and helps prevent weed growth. Weeds thrive in cool, damp soil. When the deck or patio is properly sloped, water runs down the slope and doesn’t stay stagnant in the crevices between the pavers, helping to prevent the conditions weeds need to thrive. The slope of the paved area should always tilt away from the house. When weeds are already present you have to go from prevention to finding effective remedies for the problem. 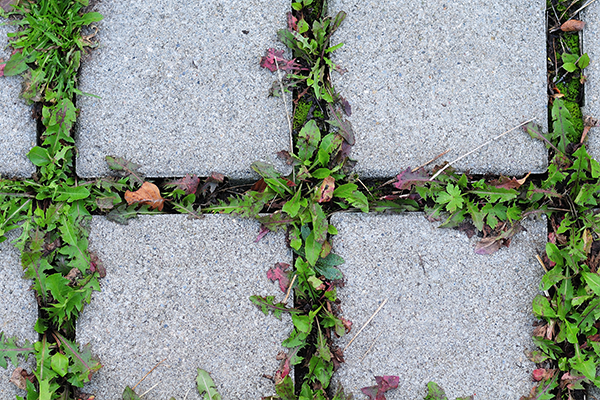 There are a number of ways you can remove existing weeds from your paver area. A single weed-removal method may not be enough. It may be more effective to combine two or more of these strategies, depending on how severe the weed problem is. Once the problem has been rectified, go back to the prevention methods to keep them away. Instead of treating weeds with harsh chemicals, open the pantry and reach for the white vinegar. Pour the vinegar into an empty spray bottle and spray the cracks between the pavers, leaving it to sit and work its way into the sand. When a few hours have passed, rinse away the vinegar with a garden hose. This simple remedy will kill the weeds without damaging the pavers or damaging nearby plants. 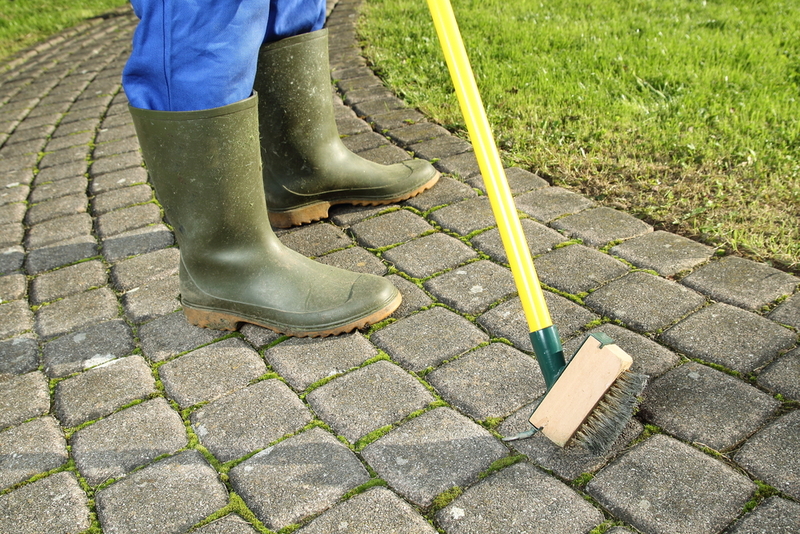 Vinegar should not discolor pavers but if you have any concerns, do the same process with an inconspicuous test spot before treating the entire area. Pressure washing the whole patio is a dual-purpose solution. Not only will it remove the weeds from the spaces between the pavers, but it will also provide a deep cleaning to the pavers, making the whole area look like new again. If you are pressure washing, do not simply use a jet nozzle. 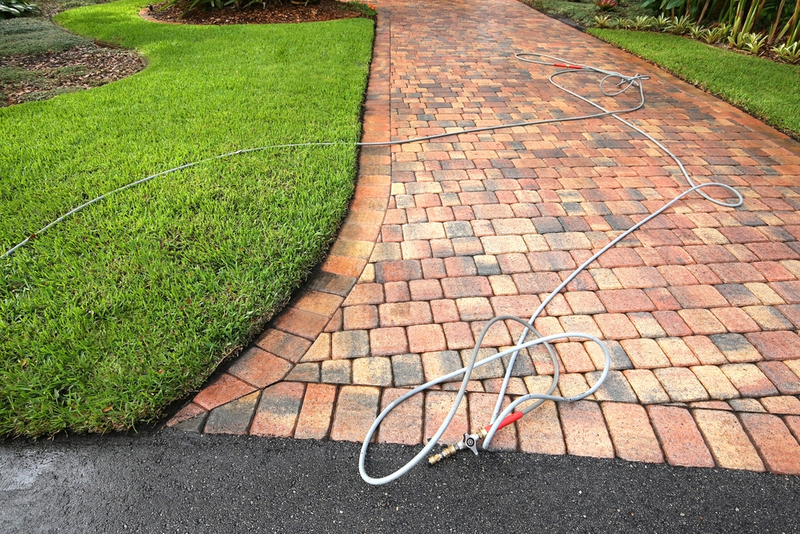 The water pressure from the nozzle can wash away the sand between the grooves and etch the surface of the pavers themselves. Instead, use a rotating surface cleaner attachment in tandem with the pressure washer. Pulling weeds is a classic method of removal but it is only effective if the entire plant is removed, root and all. To do this, reach for the lowest point of the stem and carefully pull the weed. Any roots that don’t come with the plant will grow back. This often results in multiple hand-pulling sessions before the problem is remedied. Hands-on removal is possible at the onset of a weed problem, when only a few weeds are present, but it can become a very labor-intensive and less effective method when there is a severe weed problem. An alternative to hand-pulling weeds is taking advantage of a mechanical removal solution. Crack scrapers are outfitted with L-shaped blades that pull a weed from the stem, removing the weed at the base of the stem. Normally, this method leaves behind the root, allowing for regrowth. As a result, mechanical removal is a way to temporarily restore the look of the deck or patio, but future mechanical removal sessions will be needed to remove regrowth. Once you remove the weeds through one of the methods mentioned above, stabilizing sand can be used to help keep any roots from growing back. When adding sand, it is essential that the patio is dry and free of weeds. Some paver sands feature gel additives that react with water, filling in the space between the stones so weeds have nowhere to go. Some sands also feature a pH that inhibits weed growth by making it uninhabitable. The type of sand used will help to determine the proper installation method. Follow the instructions carefully to ensure the product is used properly. Patio pavers bring a traditional elegance to the exterior hardscapes of any business or residence. Nothing will detract from the beauty of the pavers faster than the growth of weeds. When no weeds are present, simple preventative methods will help to keep them from growing. If weeds are already a problem, there are a number of methods that will eliminate the weeds. 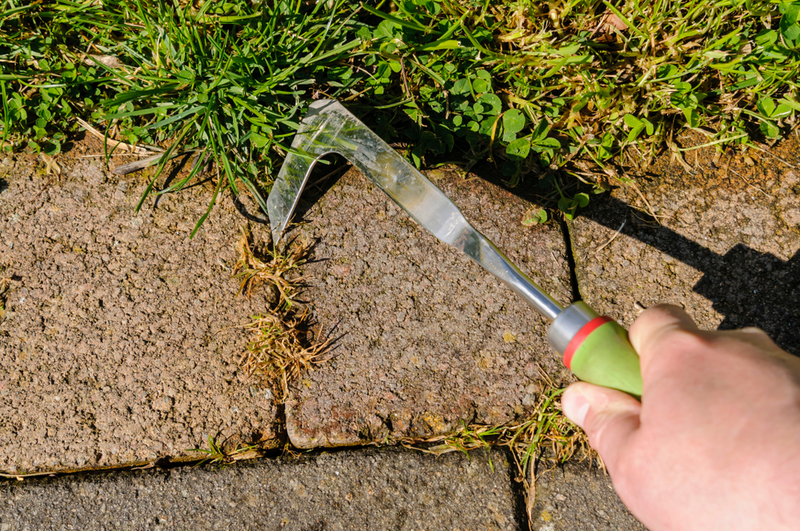 Discovering the best weed prevention and remedy for your paver area is easy when you understand what causes weeds in the first place and the pros and cons of each weed control method. A weed-free paver area is possible and goes a long way toward making a space inviting and enhancing the curb appeal of your home.